Good Morning, all! 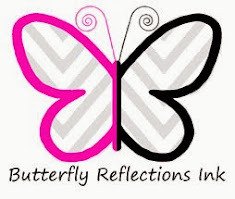 I'm super excited to be back on the Butterfly Reflections Ink blog to share another card with you today, because I've been dying to play with this stamp set since I saw it. The Sunny Studio set Autumn Splendor has had me drooling lately. The cards being made are amazing, and I knew I needed to make a card with it ASAP. So here's what I came up with! This stamp set is great for stamp layering, but honestly I don't have a ton of coordinating inks. So instead I knew I'd be making a Distress Ink card. (Oh, shucks. I was so torn up about it) I started by cutting out a stitched rectangle with the Lawn Fawn Stitched Rectangles dies. The paper I used was Bristol Smooth cardstock. I started pulling the leaves I wanted to use and the inks I wanted to use. The ink colors I used were Fossilized Amber, Fired Brick, Tea Dye, Candied Apple, Carved Pumpkin, and Ground Espresso. I rocked the perimeter of the leave on the ink pad so that it basically only stamped a rough outline of the image. Then I took slightly wet brush and pulled the color from the outline and filled in the leave. I love the uneven look it gives the leaves. I also used some of those colors to add little splatters of color on the background. When everything was dry I stamped the leaves veins with VersaMark and used white embossing powder to heat emboss them. I also heat embossed the sentiment, but used gold to make it pop from the leaves. I also used my Emboss Writer pen to add splotches of gold embossing powder to the card. To finish the card I die cut another stitched rectangle to fit a 4 1/4 by 5 1/2 card front. I wanted to create a gold frame to match the gold I'd used on the other panel. What I did to achieve this was rub the VersaMark pad along the edge of the rectangle that was going to show. Then I poured the embossing powder over it and heat set it. I had to do two coats, but I think it was worth it for the pretty outcome! This card was difficult to photograph due to the shiny gold embossing, but in real life it's gorgeous (not to toot my own horn or anything!). Thank you for stopping by today! I hope you enjoyed this card. I am seriously set into fall crafting, how about you guys!? I was resistant at first, but the fall chill has set in and I've given in to it. I'll see you all soon with another card! Nice card! Love the use of the border!